David Michael Levin's ongoing exploration of the moral character and enlightenment-potential of vision takes a new direction in The Philosopher's Gaze. Levin examines texts by Descartes, Husserl, Wittgenstein, Nietzsche, Heidegger, Benjamin, Merleau-Ponty, and Lévinas, using our culturally dominant mode of perception and the philosophical discourse it has generated as the site for his critical reflections on the moral culture in which we are living. 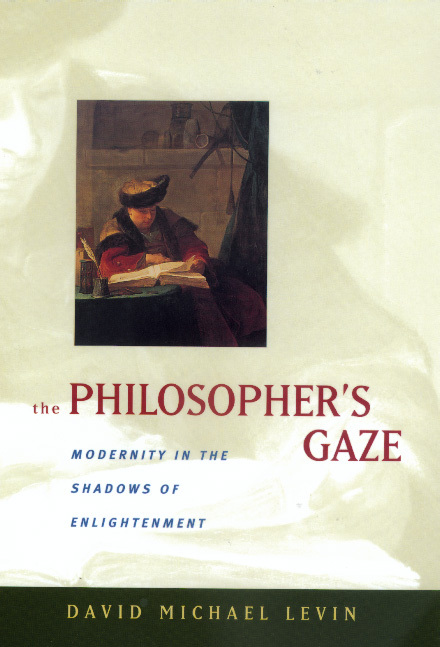 In Levin's view, all these philosophers attempted to understand, one way or another, the distinctive pathologies of the modern age. But every one also attempted to envision—if only through the faintest of traces, traces of mutual recognition, traces of another way of looking and seeing—the prospects for a radically different lifeworld. The world, after all, inevitably reflects back to us the character, the reach and range, of our vision. In these provocative essays, the author draws on the language of hermeneutical phenomenology and at the same time refines phenomenology itself as a method of working with our experience and thinking critically about the culture in which we live. David Michael Levin is Professor of Philosophy at Northwestern University and author of several books. Most recently he edited Language Beyond Postmodernism (1997), Sites of Vision (1997), and Modernity and the Hegemony of Vision (California, 1994).